As communities nationwide continue to deal with pollution, eroding shorelines, and diminishing clean water supplies, boards of directors should look to the State of Florida as an example of the inter-connectivity of waterways. In short, the lack of action by one small homeowners association in the northern part of the state may cause significant problems in communities situated hundreds of miles away. One community in Central Florida is making a bold statement by recognizing that the maintenance of its waterways and lakes are critical—not only to its own community, but also to the health of Florida’s entire ecosystem. Located in the southwest corner of unincorporated Orange County, Hunter’s Creek has approximately 25,000 residents, 4,600 single-family homes, 109 lakes/ponds, and seven private parks. The community is also home to a privately-owned golf course. During the past 30 years, the inevitable has occurred. Shorelines have eroded due to fluctuating water levels. Sediment has filled the lakes, resulting in the decreased carrying capacity necessary for stormwater retention and flood control. At the same time, invasive plants have encroached and algae levels have increased. Hunter’s Creek isn’t alone. 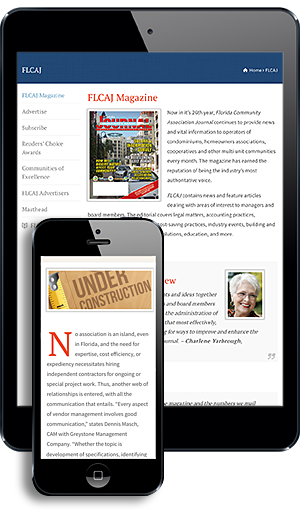 Most of the existing community associations in Florida are experiencing similar problems. The difference is that this HOA is doing something about it. To the naked eye, everything appears to be fine, but a closer look has revealed that a long-term plan must be put in place to preserve the environment not only of Hunter’s Creek but also of Florida. The Hunter’s Creek Community Association is comprised of 48 neighborhoods. Due to its strong leadership, the master association has agreed to embark on what will likely be a 10-year plan to completely restore health to its waterways. It’s important to note that Hunter’s Creek has been recognized nationally as one of the country’s premier communities and is now well-positioned to take a leadership role in sound environmental best practices as well. The community’s location is unique in that it is situated at the headwaters of the Everglades, the slow-moving river that flows south, eventually making its way to the ocean in southern Florida. Hunter’s Creek’s stormwater ponds connect directly to the Kissimmee River and then to the Everglades. More than 30 years of grass clippings, acorns, leaves, fertilizers, and sediment have accumulated. This situation has made Hunter’s Creek waterways “sick” and also infected other community waterways downstream. This phenomenon is typical with thousands of community associations throughout Florida, but Hunter’s Creek hopes to rectify the situation with a plan that will restore shorelines and clean its water before it enters Florida’s larger, connected lake and canal systems and heads south. Lakes That Are Not Really Lakes: Community waterways have actually been created by developers as retention ponds that store run-off as a way to prevent flooding. They also are catch basins for excess nutrients, pollutants, lawn clippings, and pet waste. These ponds regularly suffer from poor water flow and low oxygen levels, which results in optimal conditions for algae growth. Ecologically Safe Treatments: Until recently, standard treatments involved spraying toxic herbicides or required manual work to eliminate invasive plants and algae. For the most part, these are simply a band-aid approach. However, through the use of bacteria, we are able to eliminate nutrient pollution from runoff that acts as food for harmful algae. By eliminating the food source, we can eliminate the algae. By using beneficial bacteria in these stormwater ponds, it is possible to “eat” the excess nutrients created by years of grass clippings, pet waste, fertilizer run-off, and muck accumulation. This treatment program is a similar process to the probiotics that are used to aid in human digestion. More Oxygen: The other important part of the plan is to continually pump oxygen into the waterways to enhance their circulation and to create favorable conditions for water quality. Bringing Back Invertebrates: Freshwater invertebrates are an important part of an ecologically sound water system, providing water filtration and biomass reduction, but some herbicides kill these species. Once the waterways are clear of chemical pollutants, these natural filtering systems can be re-introduced into the environment. Planting Native Vegetation: The removal of invasive waterfront plants and the installation of native Florida vegetation improves water quality and habitats. Shoreline Restoration: With a drastic fluctuation of water levels over many years, shoreline erosion is inevitable. This creates unstable land as well as dangerous conditions for landscapers, golfers, and pedestrians. Cable lines can be exposed and homes may flood due to encroaching water. Hunter’s Creek has used Dredgesox in past restoration projects, and future activity will likely involve the installation of this environmentally safe and long-lasting solution that satisfies all best management practices. This process involves dredging sediment from lake bottoms and then filling a large taco-like mesh structure, which is sculpted and secured to the shoreline. Sod, trees, and plants are then rooted through the mesh, thus creating a “living shoreline.” This system also creates a filter, that prevents harmful nutrients from entering waterways. Healthy balance of native plants and fish. Keep in mind that the challenges of Hunter’s Creek are not unusual. They are very typical throughout Florida community associations. The difference is that an enlightened board of directors recognizes the importance of implementing sustainable and environmentally safe solutions, even at a greater cost. The primary goal of an HOA board should be to protect, and even increase, home values; and maintaining a healthy environment, including waterways, is a major component to that objective. The Hunter’s Creek action plan will improve conditions and lifestyles within their community. Additionally, the benefits will flow downstream to other communities, who will notice an increase in clean water flowing into the Everglades and beyond. This green plan should become a model for associations, municipalities, and golf courses throughout Florida and the United States. General Manager of the Orlando office of Lake and Wetland Management Inc.
Chad Bass is General Manager of the Orlando office of Lake and Wetland Management Inc. (www.lakeandwetland.com). Founded in 1992, Lake and Wetland Management is a full- service environmental resource management company. Its State-certified, trained biologists provide environmental services for waterways, wetland management, lake management, and natural areas throughout Florida, leading the industry of environmental services. The firm works closely with many government agencies, builders, developers, property managers and homeowners associations. Lake and Wetland Management has 14 offices throughout the state.